2000 4.6 HSE Holland & Holland Edition: Suggested Retail Price $79,000 (new). All were "Tintern Green Metallic" (a bluish green) and had body color bumpers and side skirts with a Holland and Holland badge on the right side of the tailgate. They also had body color paint on the inside of the spokes on the 18" Hurricane wheels. The seats were a dark "bridal leather" with walnut piping and wood-grain leather, gunstock gray and walnut wood accents, gunmetal blue trim details on fascia rail. They had a leather covered glove box, under steering wheel area and center console sides (most Range Rovers had plastic in these areas). The words Holland & Holland were in gold on the wood dash trim in front of the passenger. They had a two tone brown and black leather steering wheel and two tone door trim with dark leather to match the seats on the doors. All came with the Land Rover kit to turn the spare tire cover in to a picnic table. 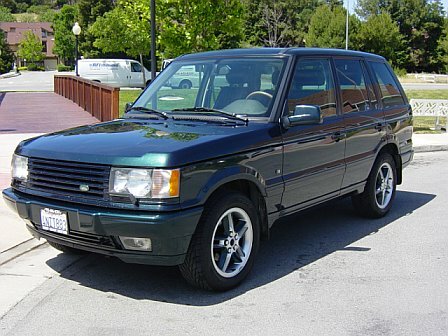 Land Rover made only 125 for the U.S. in 2000 . They had the Harman-Kardon Premium Audio System With 7 Speakers Including Powered Subwoofer and 180 Watts of Power Along with A 6 Disc CD Changer. Land Rover and its equivalent in the gun-making/sporting apparel business -- the British firm Holland & Holland --have collaborated to create one of the most exclusive Range Rovers ever produced: the 2000 model year Holland & Holland Range Rover. Holland & Holland, like Land Rover, is a name synonymous with adventure and style. The company was established in 1835 and is still famous today for its handcrafted firearms and elegant outdoor apparel. Land Rover and Holland & Holland customers share an affinity for adventurous, affluent lifestyles. Grounds at Northwood, Middlesex, England, the Holland & Holland Range Rover will be a special-edition model. Initial production plans call for only 400 units to be produced and, of those, a mere 125 to arrive on American shores . "This partnership is a perfect fit, as Holland & Holland and Land Rover are legendary brands steeped in traditions of adventure, British style and exquisite craftsmanship. The detail work on the Holland & Holland Range Rover is like nothing we've done before and is very much in line with what makes a Holland & Holland firearm so distinct." Each Holland & Holland Range Rover represents more than 30 hours of handcrafted finishing work at the Land Rover Special Vehicle facility in Solihull, England. The vehicle's interior is dressed with exquisite dark-brown Bridle leather seats piped with Walnut leather. The steering wheel, knee bolsters, glove box door and grab handles are also trimmed in this fine Bridle and Walnut leather. French/American high-grade, low-sheen, gunstock-grain walnut veneer -- similar in appearance to the wood used to make Holland & Holland firearms -- is placed throughout the cabin, adorning the instrumental panel fascia, the center console and all four doors. The walnut veneer on the doors is decorated with metal inlays that simulate the fine engraving found on every Holland & Holland firearm. Blue/black chrome metal resembling the signature metalwork of a Holland & Holland firearm is used to trim the cabin. This chrome metal is also used to create the Holland & Holland nameplate that appears on the vehicle's tailgate. Chrome sill plates accent the base of each door opening. The Holland & Holland Range Rover comes fully equipped with a Land Rover's JAMES (Journey Assistance & Mapping Exploration System) navigation system and a 12-speaker, 300-watt harman/kardon(R) sound system that includes a separately amplified dual-driver subwoofer, a six-disc CD auto-changer and steering-wheel-mounted volume, station and track/disc selection controls. Comfort and convenience features such as an automatic, dual-zone climate control system with pollen filtration, an electrically heated windshield, 10-way power-adjustable, heated front seats with memory and a sophisticated security system with perimetric and volumetric capacity are also standard equipment. The special-edition Holland & Holland Range Rover features the full complement of technology and guts that helps every Range Rover navigate the world's most extreme terrain. And the vehicle still manages to be more luxurious, comfortable and capable on-road than many high-end touring sedans. Range Rovers are built with reinforced, boxed-steel ladder-style frames that ride atop a standard Electronic Air Suspension (EAS) system, which replaces conventional coil springs. The EAS system employs a computer controlled air compressor and four heavy-duty air springs -- one mounted at each corner of the vehicle -- to provide Range Rover with five discrete ride-height profiles that can be either manually or automatically selected. This system gives the vehicle a total height adjustment range of up to 5.3 inches. The air springs are part of a sophisticated suspension system that incorporates forged-steel radius arms, an anti-roll bar and a Panhard rod to locate the front axle. The rear axle is located by composite trailing arms and a Panhard rod. As with all Range Rovers, the special-edition Holland & Holland model is equipped with permanent four-wheel drive. The system-comprised of three differentials, a two-speed transfer gearbox, a center viscous coupling unit and standard four-wheel Electronic Traction Control (4ETC) -- is in constant operation and provides exceptional maneuverability on all surfaces. For stopping, Range Rover's four-channel ABS monitors each wheel individually 250 times per second and, when active, can cycle the brakes up to 10 times per second. This advanced ABS system is designed to even tell the difference between on- and off-road surfaces, thus optimizing stopping performance in all situations. The Holland & Holland Range Rover is motivated by a 4.6-litre V8 engine that turns out 222 horsepower at 4,750 rpm and 300 pound-feet of torque at 2,600 rpm. Eighty percent-240 pound-feet-of peak torque is available between 1,400 rpm and 4,500 rpm. Power is sent to all four wheels through an electronically controlled, ZF four-speed automatic transmission, equipped with a locking torque converter to provide prompt, smooth gear changes. For added versatility, Range Rover's transmission offers two shift programs for High Range and two more for Low Range settings. In High Range, Normal and Sport Modes are available. Sport Mode allows the transmission to downshift sooner and upshift later for more assertive performance. Normal and Manual Modes can be selected in Low Range. Manual Mode shifts the vehicle to a selected gear and holds that gear during precise off-road maneuvers. A 3.27:1 low-range reduction gear provides Range Rover with exceptional engine braking for climbing down steep grades or over large obstacles.